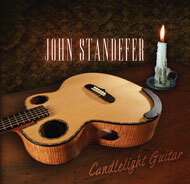 This extended CD contains 18 original John Standefer compositions in one very special collection. The guitar pieces on this CD represent John's orignal works written from 1980 to the present. The album includes previous recordings, newly recorded versions of some of John's classic songs and three brand new titles. Inspired by God's grace, the love of wife and family, and the many friends John has made throughout his travels, this collection reflects the beauty of life, the power of love and all that's good with the world.